Product #20917 | SKU 3610-014-110 | 0.0 (no ratings yet) Thanks for your rating! Uses our latest “Deep Mount” LED technology, delivering impressive lumens and lux performance. 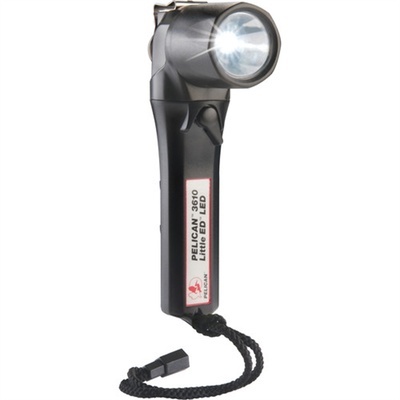 The Pelican 3610 Little Ed Right Angle LED Flashlight (Black) is a right angle flashlight that uses Pelican's Deep Mount LED technology for delivering 183 lumens output. The flashlight features tough and corrosion proof EXL body. It also features stainless steel mounting clip that allows for hands-free operations. 3610 Little Ed is powered by four AA alkaline cells (included).